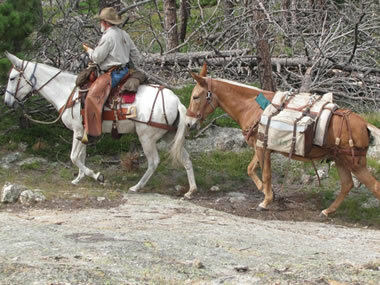 The winner of the 2013 Double Diamond Award is the Black Hills Back Country Horsemen of South Dakota. 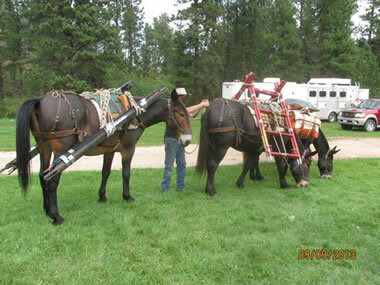 The Black Hills Back Country Horsemen of South Dakota (BH BCH SD) members won the the award for their efforts in assisting USFS – Region 2 Packstring packing in equipment for the Harney Lookout Tower Preservation project during September 9 – 13, 2013. 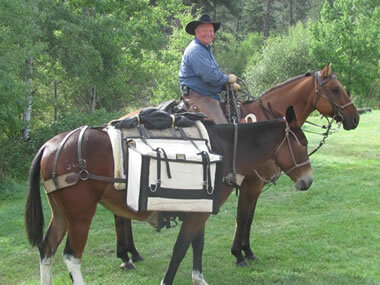 BH BCH SD members had a rare and unique opportunity to assist USFS personnel including USFS – Region 2 Lead Packer – Glen Ryan with his mule packstring on a significant Black Hills National Forest (BHNF) project. 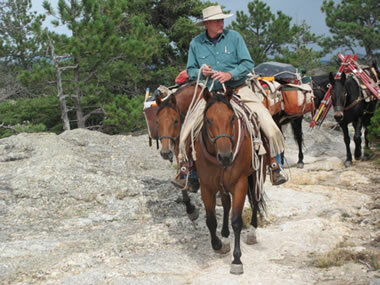 BH BCH SD members were foremost in this historic project with the overall goal to preserve the Harney Peak Lookout Tower for future generations of hikers, runners and horseback-riders. The Harney Peak Lookout Tower resides in the Black Elk Wilderness on the Black Hills National Forest in South Dakota. The Harney Peak Lookout Tower has become a significant destination for non-motorized recreation users on the BHNF. Harney Peak rises to 7, 250ft elevation and has been a historical landmark in the Black Hills prior to South Dakota achieving statehood. Harney Peak was significant to Native Americans of the area and also as a landmark to the first European Americans to travel to the Black Hills. General Armstrong Custer was noted to have ridden his horse near the summit during his 1874 military expedition into the Black Hills. The Harney Peak summit offers a panoramic view of the surrounding Black Hills area which eventually resulted with Harney Peak becoming a fire lookout in 1911. A formal fire tower structure was not built until the 1920’s which was constructed of wood. The construction of the Harney Peak Lookout Tower in native stone began in 1935 by Civilian Conservation Corps (CCC) and was completed by 1938. The stone was hauled from French Creek by man and mule during construction of the tower. The Harney Peak Lookout Tower had been utilized by the USFS – Black Hills National Forest as a manned fire tower until 1965. The fire tower was later utilized by Custer State Park until it was formally dis-banned as a fire lookout in 1967. The advent of airplanes and additional technology for fire detection has resulted with the tower being officially disbanded for fire. Harney Peak Lookout Tower has since become recognized as a National Historic Site as well as a recreational destination over the years. 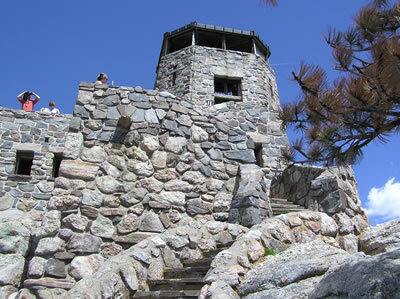 The USFS–BHNF proposed re-doing structural work to the famous Harney Peak Lookout Tower. Years of weather damage, vandalism and tourist use had taken its toll on the National Historic structure. The Harney Peak Lookout Tower was missing windows allowing weather to erode and wear the structure’s interior. Numerous original structural stones to the steps and tower were also missing on the structure’s exterior. USFS archeologists and Wilderness personnel initiated planning a project in order to return the Lookout Tower to some of its original state. It was proposed that windows could be re-installed in the lower structure while also locating and replacing the stones that had been removed due to weather, vandalism, etc. Planning and coordinating a project of this magnitude is unfathomable to most individuals with so much at stake – including Mother Nature. 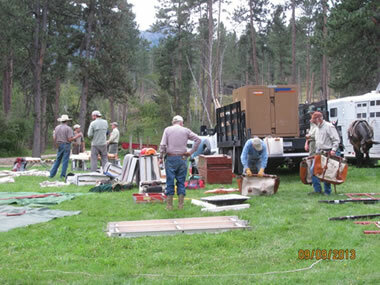 A crew of; USFS personnel (fire, wilderness, R2 packstring and archeology), volunteers from hiking groups, local masons, carpenters, and BH BCH SD members assembled to help during the week of September 9-13, 2014 on the project. 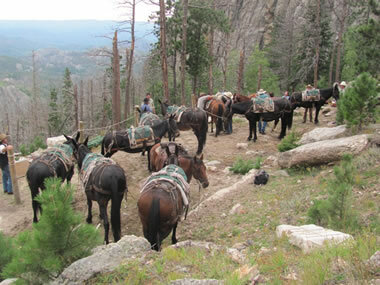 Volunteers and USFS personnel gathered at Willow Creek Horse Camp or Harney Peak Lookout to assist with the endeavors of the project. It was an arduous undertaking to coordinate personnel plus livestock to initiate this project. Unfortunately, on September 8, 2013 Trail #9 to Harney Peak Lookout was affected by a late season thunderstorm with 70 mph winds. The weather played havoc on the ponderosa pine forest area already devastated by the Mountain Pine Beetle. After the winds went through, any “standing dead” ponderosa pine trees near Trail #9 either fell down along or on the trail. BH BCH SD members were instrumental with cutting/removing dead/down trees that had crossed Trail #9 overnight. Trail #9 begins near Willow Creek Horse Camp in the Norbeck Area which allows chainsaws for trail clearing. 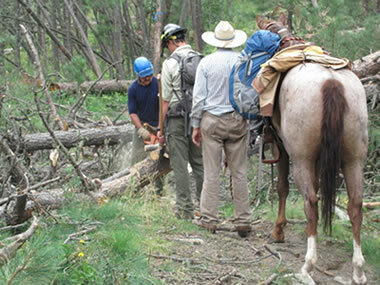 Trail #9 soon winds into the Black Elk Wilderness where only cross-cut saws and hand tools could be utilized for trail clearing. A hardy BH BCH SD crew assisted several USFS Wilderness personnel with the overwhelming task of clearing the trail to allow the R2 packstring through with supplies/materials. 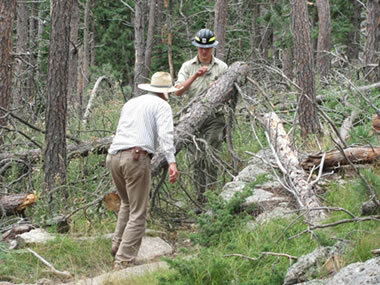 It took 10 hours of riding, packing, sawing, cross-cutting and removing trees to re-open Trail #9 on September 9, 2013. 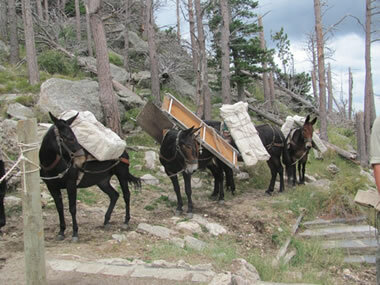 BH BCH SD Members with USFS – Fire and Wilderness personnel clearing Trail #9 to Harney Peak Lookout in order to allow R2-Packstring through with materials and supplies for project. 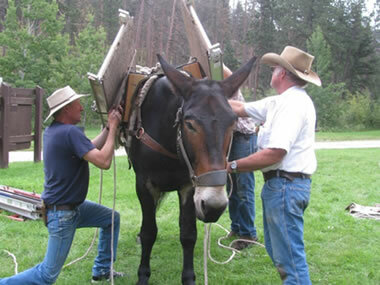 BH BCH SD members were also instrumental from the ground by assisting Glen Ryan – USFS lead packer and his assistant Barrett with loading/packing 10 head of mules/horses with masonry supplies for the project. BH BCH SD members also utilized personal pack stock to assist with the transport of supplies. Tools, scaffolding, windows, concrete, water, and misc. items were packed in for 3 days to meet the needs of the personnel (archeologists, masons, carpenters, volunteers) for the week. 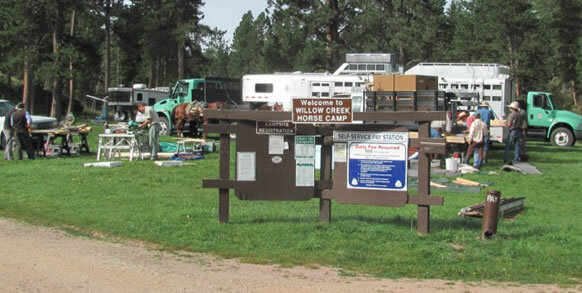 The items that were not used or that needed to be returned to Willow Creek Horse Camp had to be packed back down the trail on 9/12/13 and 9/13/13. Approximately 40+ loads of materials were hauled in by USFS and BH BCH SD packstock for this project. The week long project was considered a success overall. 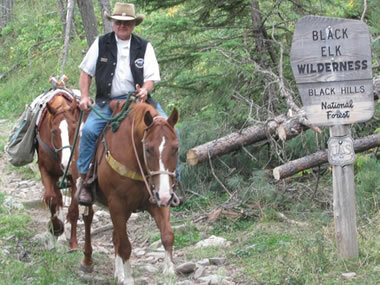 Contributions by BH BCH SD members were greatly appreciated by Glen Ryan and his assistant plus Dave Pickford – Wilderness and Recreation Specialist for the Black Hills National Forest – Hell Canyon District – Custer, SD. The Harney Peak Lookout project is to continue for the next 2 years prior to “proposed” completion in late 2015. 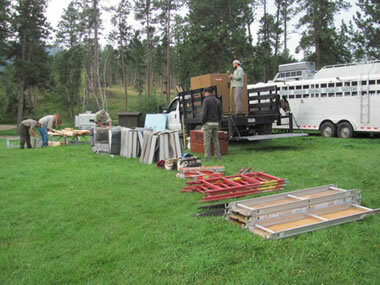 Materials and equipment laid out to organize for loading packstring with BH BCH SD members, USFS personnel and volunteers assisting. 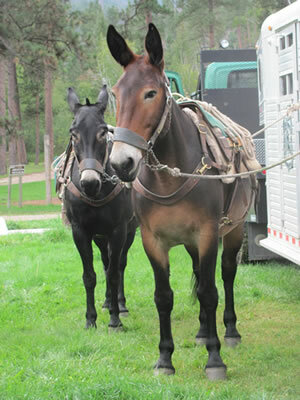 BH BCH SD Member – Ralph Carlson helping load USFS mules with Glen Ryan. Doug Bechen – BH BCH SD on Scotch with packmule – Ruby ready to head out – packing water for all the volunteers at the Harney Peak Lookout Tower.